Will you like to discover how important owning a car trash can can really be? 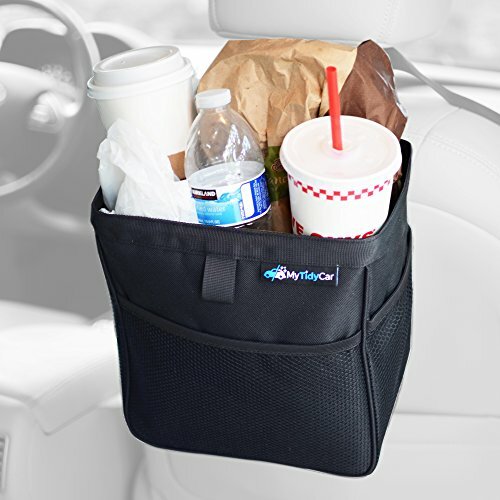 Whether you are taking a short or long trip across the country, certainly your car whines up with trash & clutter more than you expected, MyTidyCar's Car trash can is all you can ask for; our hang-able car trash bag is carefully produced to conceal in all those food spills, waste and clutter out of sight, which makes your car clean and your trip a trash free exciting one. Not only that but it also acts as a car cooler for storing those drinks and water bottles and has a spring frame closure to keep them cool for a long time. Our car trash bag is water proof and designed with a high quality durable spill-proof sealed seams which are able to absorb moisture, control odor especially when the car trash can is sealed, which will always keep your car upholstery & carpets looking brand new. This car trash hanging bag possesses a large gallon 3 capacity interior, to accumulate enough dirt's, an adjustable webbed hanging strap that fit any headrest post, 3 pockets for storage and a spring frame closure to keep its contents out of sight. If you are looking for the best Car trash can, look no further as this is the best there is, put MyTidyCar's car trash can in your car today and enjoy for a clean and odor free drive. ✓ 100% SATISFACTION GUARANTEE - Buy It Now with Confidence, This Best ★ TOP QUALITY CAR TRASH CAN ★ Will Keep Your Car Clean 100% and We Guarantee Satisfaction With a 100% Lifetime Money Back Guarantee. If you have any questions about this product by MyTidyCar, contact us by completing and submitting the form below. If you are looking for a specif part number, please include it with your message.